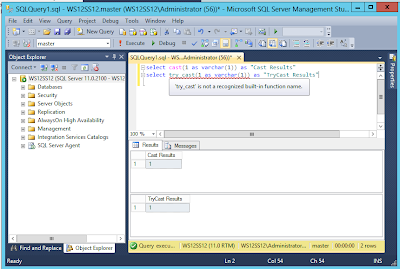 Ok, so in SQL Server Management Studio 2012, there's automatic function identifying. Nice feature. OK, I thought. try_cast isn't available in SQL 2008 R2. I must be in the wrong window. So I switched to SSMS 2012, and pasted in the same statement. Yet, I got the same error. There's a book Microsoft Press put out, "introducing" SQL Server 2012. I say that in quotes because the book is ~300 pages. Yowza! Download it, put it on your e-reader, and commute away! There is a great line in this article about how hard it is to break into an existing market. That is so true. Dan Brown, author of 48 Days, says that you have to identify your USP - your Unique Selling Proposition. Said another way: why should I buy from you? The idea of clearing out all the cobwebs in your message before you begin is something near and dear to my heart - after all, as a leader, I routinely have to mentally rehearse before doing something as "simple" as communicating good news to a client. If I'm not selling myself at every opportunity, then my message is getting lost. So far, all I remember of Foundation DB is "another NoSQL vendor." It'll be interesting to see how they carve out a position in the marketplace. So I got a new phone. And on receiving it, I found that Yahoo! Mail was available on the phone via the built in wizard. On trying to log in, I found that Yahoo! Mail as a service option was set to PoP3 as the default, and wouldn't reflect message deletions on the server, which was, honestly, pretty maddening. I mean really - this seems like a mature technology feature that should be enabled, fully mature, and available from a vendor as large and complex as the Yahooligan crew. So, I was poking around for answers, and realized to get Yahoo! Mail on my Android as IMAP was going to be the answer, and that was as simple as pushing "manual setup".